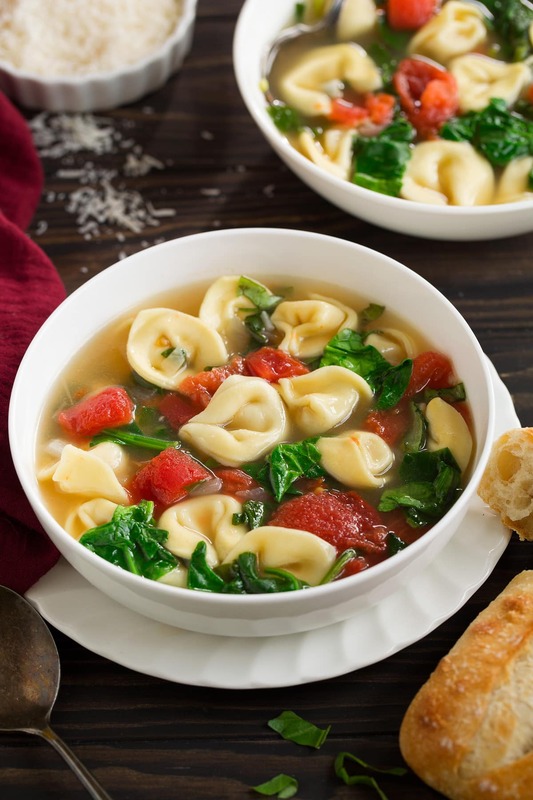 Tortellini Soup – with fresh tomatoes, fresh spinach, fresh garlic and fresh basil! 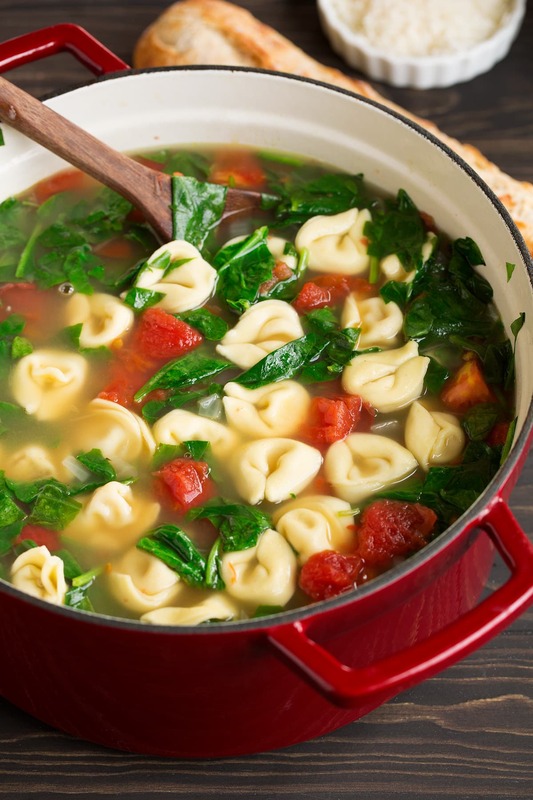 It’s such a tasty, colorful soup and it’s brimming with cheesy flavor and so much fresh goodness. Such a comforting soup you’ll want to make year round! 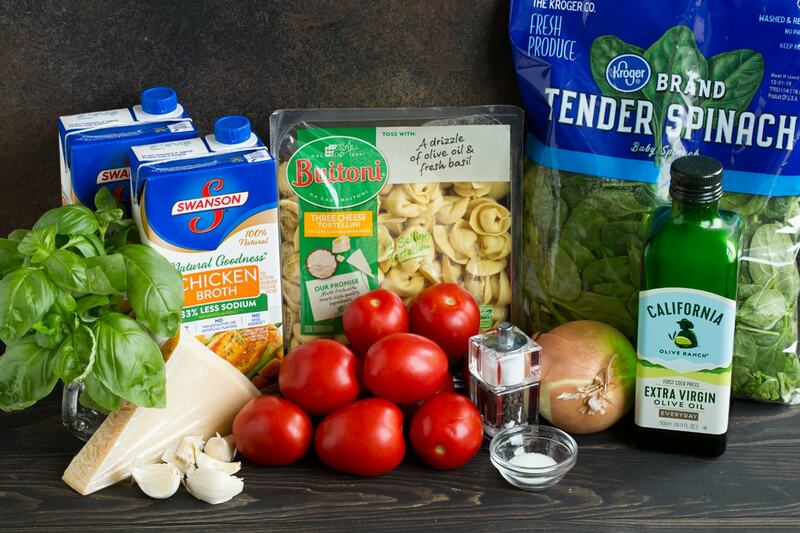 Cheese tortellini is one of the tastiest ingredients! 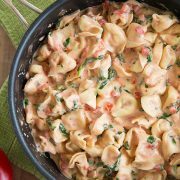 I absolutely love it and I also how the store-bought, refrigerated tortellini adds a major short cut and makes it so much easier. I love it tossed with pesto or another easy sauce for a quick dinner and I also love to add it to soups. This is a soup I love to make in the summer but obviously I love it in the winter too when it’s so cold outside, and it’s perfect for the month of December with it’s perfectly festive natural red and green colors. 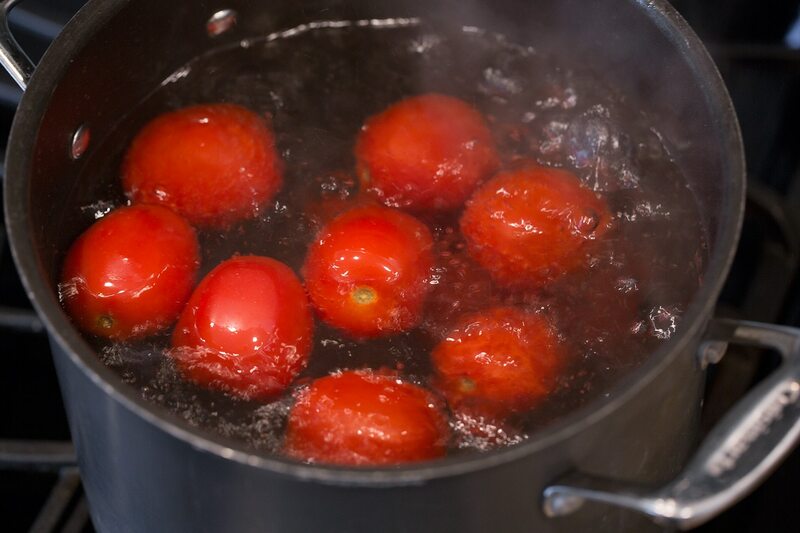 Once water in pot boils, carefully drop tomatoes into water and boil until easy to peel, about 4 minutes (if a few of them aren’t peeling easily even once you slice through the skin, you can cut an “X” in the bottom of the tomato then return to water for about another minute until skins slightly pull alway). Remove from boiling water, let cool on a cutting board (or for faster cooling chill in a bowl of ice water) then peel seed and dice into bite size pieces, set aside. Heat olive oil in a pot over medium heat, add onion and saute until tender, about 5 – 6 minutes. Add garlic and saute 30 seconds longer. Pour in chicken broth, sugar and season with salt and pepper to taste then increase temp to medium-high heat and bring to a boil. 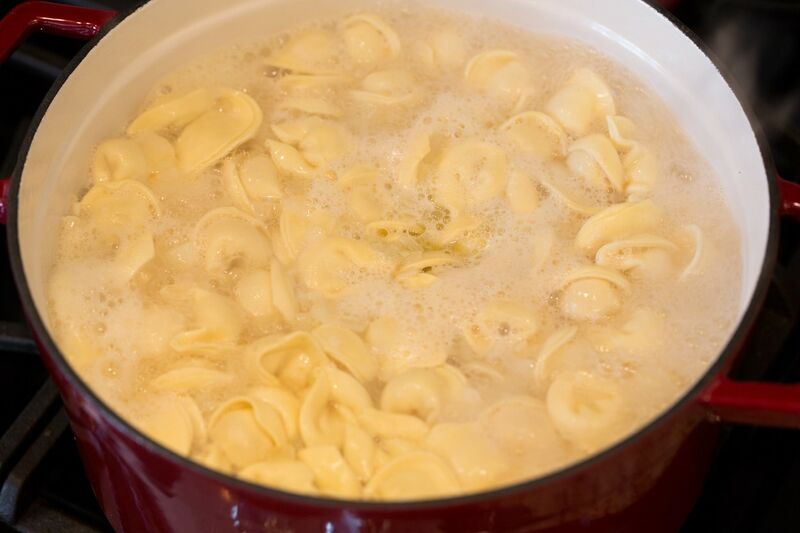 Once it reaches a boil, add tortellini, season with salt and pepper to tastes and boil 7 minutes (or longer if directed on tortellini package). 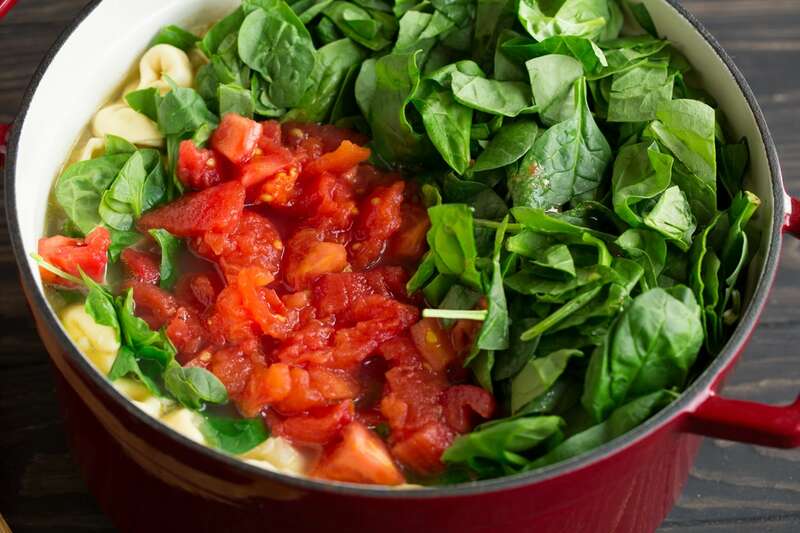 Stir in tomatoes, spinach and basil and cook until spinach wilts, about 30 seconds. Serve warm topped with Parmesan cheese. Boiling, peeling and seeding the tomatoes takes just a little bit of time, but once you get the hang of it’s a breeze. The fresh tomatoes in this soup are so delicious, but in the winter if you can’t find good fresh ones (or if you just don’t have the time to prep the fresh) the canned work great too. If you are using canned tomatoes in place of fresh add them when adding the chicken broth. Use 2 (14.5 oz) cans or a 28 oz can. Regular cut or petite cut will work great, or try it with canned San Marzano’s or canned Roma’s (break them up with your hands since they come whole). Can I Use Dried Basil? Dried basil could be used here as well, it won’t be quite as good as the fresh but it will work. If going that route use 2 tsp dried, adding it along with the chicken broth. 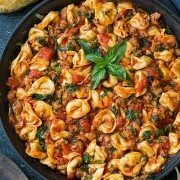 Can I Use Frozen or Shelf Stable Tortellini? 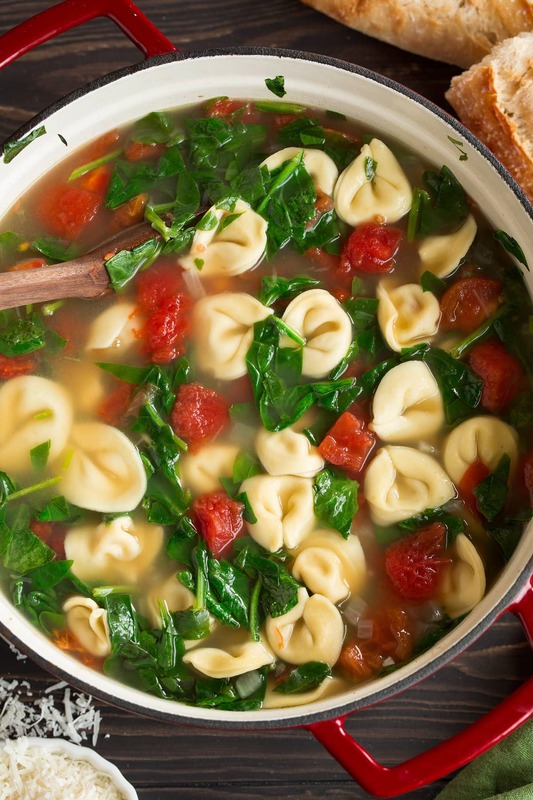 Refrigerated tortellini is best in my opinion but frozen tortellini could be used here as well. Add additional cook time as needed (according to package label). Skip shelf stable tortellini the quality is the least of the three options. 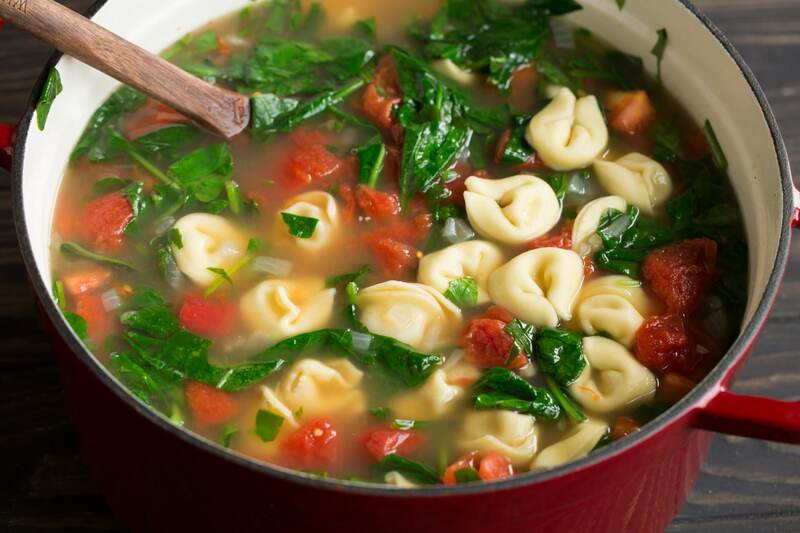 More Italian Soup Recipes You’ll Love! 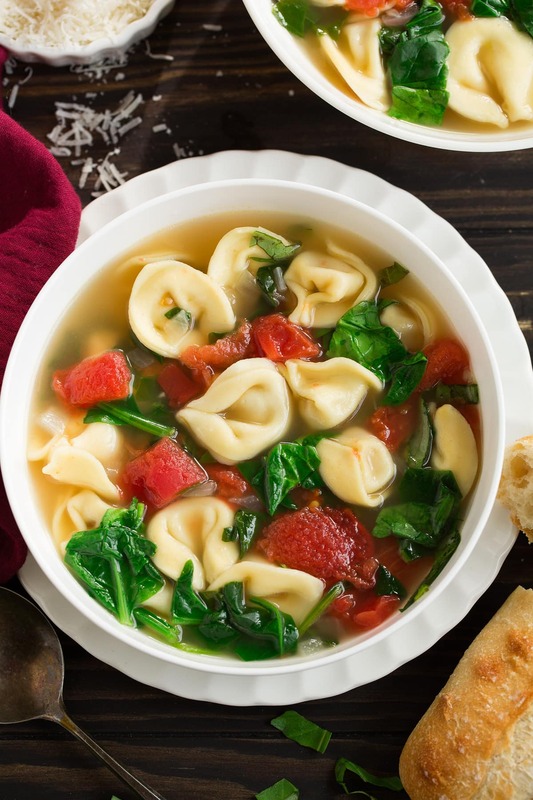 A delicious tortellini soup that's brimming with fresh tomatoes, fresh spinach, fresh garlic and fresh basil! 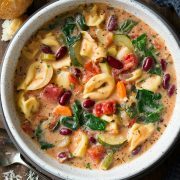 It's such a tasty, colorful soup that's loaded with cheesy flavor and so much fresh goodness. Such a comforting recipe with simple ingredients that you'll want to make year round! Heat a pot of water to a boil and fill a medium mixing bowl with ice water. Once water in pot boils, carefully drop tomatoes into water and boil until easy to peel, about 4 minutes (if a few of them aren't peeling easily even once you slice through the skin, you can cut an "X" in the bottom of the tomato then return to water for about another minute until skins slightly pull alway). 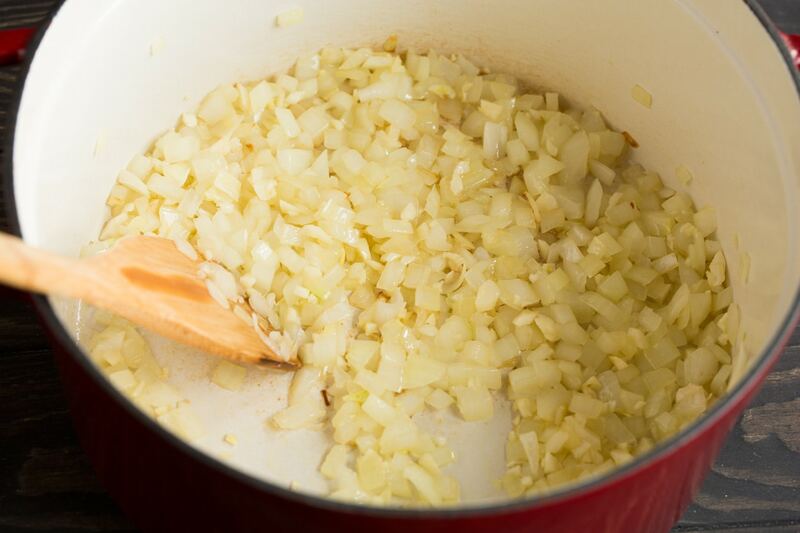 In a pot, heat olive oil over medium heat, add onion and saute until tender, about 5 - 6 minutes. Add garlic and saute 30 seconds longer. Pour in chicken broth and sugar, season with salt and pepper to taste, then bring to a boil over medium-high heat. Stir in tomatoes, spinach and basil and cook until heated through and spinach wilts, about 30 seconds. Serve warm topped with Parmesan cheese. 2 (14.5 oz) cans diced tomatoes can be used here in place of the fresh, add canned tomatoes along with chicken broth if going this route. This makes a big batch of soup and tortellini doesn't make great leftovers in here because it will start to get soggy overnight. With that said if you aren't planning on feeding a big family then scale the recipe down to half.